About.com has tested an All-in-One wireless inkjet printer from Lexmark. The Lexmark printer is called Lexmark Genesis S816 and is able to print up to 33 pages per minute or so Lexmark claims. Let us hear what the reviewer thinks about this upright multifunction printer. About.com ends up giving the Lexmark Genesis S816 a good review with an overall score of 4 out of 5 possible stars. 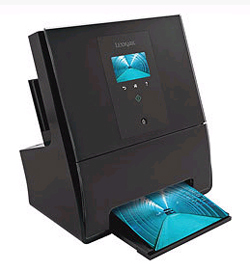 The printer is able to make prints and photos of excellent quality, the customable applications work good, the wireless connectivity to use and it is a plus that the printer has automatic duplexing. On the negative side we find a couple of points like that photos are tricky to print, the touchscreen could be bigger and it does not have duplex scanning. In the end this is a very good AIO printer that makes good looking prints. Read the full review of the Lexmark Genesis S816 All-in-One wireless inkjet printer here.